Ocean view Party Penthouse in the heart of Jaco Beach. Vista Mar is the most upscale high-rise development in Jaco Beach, appealing to the most discriminating traveler by offering spacious, high end condos with breathtaking vistas of the Pacific coast-line and the surrounding mountains. The penthouse, featuring 4 bedrooms and 3.5 baths, is luxuriously decorated with the finest interiors and an expert’s attention to tasteful details and amenities. The open concept kitchen and expansive living and dining areas lead out to a spacious wrap around balcony, which offers gorgeous 360 degree views of the ocean and rain forest. State of the art appliances make the well fitted kitchen a dream for the gourmet in the group. Situated perfectly at the center of Jaco Beach, the building is adjacent to the only casino in Jaco and all amenities in town are within easy walking distance. In addition to it’s terrific location, Vista Mar offers direct beach access, as well as luxury hotel-like amenities such as a restaurant, room service, fitness studio, spa services, a large swimming pool, Jacuzzi, underground parking, and a tour desk. Each building features 24 hour guarded security, security cameras in all hallways and entries, as well as keyless entry codes. This penthouse condominium is well suited to small groups of adults only.Just minutes away from Hotel Cocal & Casino. Enjoy a drink at the Cocal Pool Bar, is Jaco Party Central! Open all day and then live music on most evenings until 10pm... A great place in Jaco to start out your night! Latitude Restaurant is directly on the beach and offers a great selection for breakfast, lunch, dinner and snacks. Palm trees line the beach at the edge of the patio dining area, where you can try exquisitely cooked local delicacies or more traditional American meals. A perfectly cooked Chateau Briand is “The Pride of Hotel Cocal”. Hello there, my name is Mike Hardy and I own several properties in Jaco / Herradura. I live in Jaco and have been working with properties for the last fifteen years. Most would say I have know as much about the area as anyone. I have been hosting family, friends, and customers at the resort and will guarantee you get the best vacation at the best value. I know how important a quality and hassle free vacation is and I am not just providing you a great property but a wonderful vacation experience. Let me and my staff take care of everything for you. Vista Mar is the finest, new luxury high-rise development in Jaco, appealing to the most discriminating traveler by offering the most spacious, high end condos with the best views of the coast-line and the surrounding mountains. Situated conveniently in the heart of town, the building is adjacent to the only casino in Jaco and all amenities in town are within easy walking distance. Optimum Condo amenities include outdoor pools, professional gym, beautiful public areas, direct beach access & walk to downtown Jaco to enjoy over 100 different restaurants and shops. Fabulous Pacific Ocean views and sunsets from front rooms and balconies, with hillside and mountain views from the back bedroom. These luxury condos feature three bedrooms, each with en suite baths. Spacious living and dining area lead out to expansive wrap around balconies that offer gorgeous 360 degree views of the ocean and rain forest. State of the art gourmet kitchens with stainless steal appliances make meal preparation a pleasure for even the most discerning chef. The building features 24 hour guarded security, security cameras in all hallways and entries, as well as keyless entry codes. Top floor penthouse units are uniquely luxurious, offering two different floor plans for the master suites with all bedrooms offering private access to the balcony. 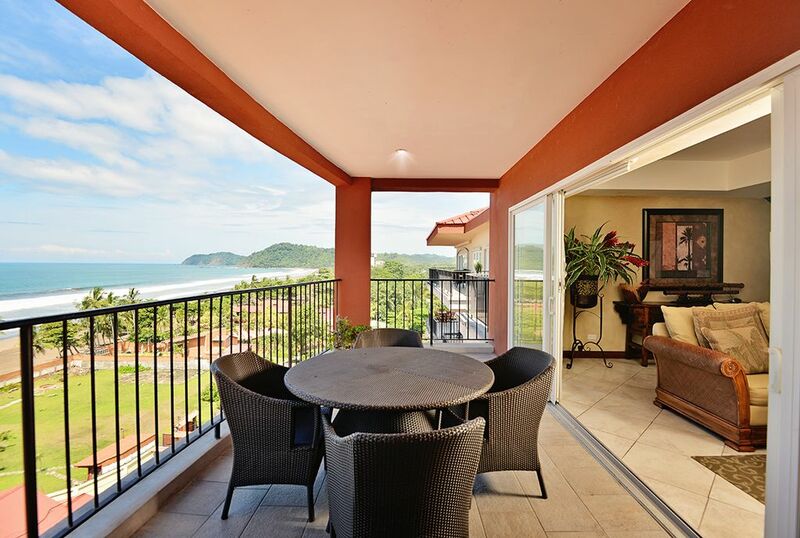 This condo has an amazing location overlooking Jaco Beach and just steps away from restaurants and nightlife. Enjoy the famous beaches, surfing, zip-line canopy tours, restaurants, exceptional night life with the Cocal Hotel and Casino across the parking lot, room service, beach-side massages, and so much more. My friends and I had a wonderful time the check in process was fast and easy the condo was clean and beautiful with a great view. the location is perfect and within walking distance of most everything in town. The only bad thing was that we couldn't stay longer. Can't wait to go back. Hi Chris, It was a pleasure to host you and your friends. Thank you very much for taking the time to leave a review. It was great to host you and we look forward to seeing you again soon. My boyfriend and I absolutely loved this property. It was a great location; walking distance to restaurants, shops, and the beach. It was clean and very spacious. The views from the living room balcony and master bedroom balcony were phenomenal. We loved watching the sun set each night from there. There is a guard at the entrance and we never felt unsafe. I would highly recommend this property to anyone. There is a lively bar at the hotel adjacent to the property but since it is on the 6th floor we could not hear the music or noise coming from it. Very quiet and peaceful. I have only praises for this property and we are looking forward to our next trip back! Just minutes away from world famous beaches, surfing, zip-line canopy tours, restaurants, exceptional night life with the Cocal Hotel and Casino across the parking lot, room service, beach-side massages, and so much more. Air conditioned casino is the perfect place to meet for an evening of fun and excitement. Take a break from the sun and have a beverage in the Cocal sports bar where you can watch a game via satellite on a big screen television. Perfect for events like Bachelor parties, birthdays, anniversary, guys night out. Adventure and a luxurious experience that will bring memories for a life time. Book it today and experience coastal luxury for yourself! There is simply no better way to experience Costa Rica.